This section allows you to add CSS and clear the cached files that are built when WP Post Map is installed and/or the options are saved. 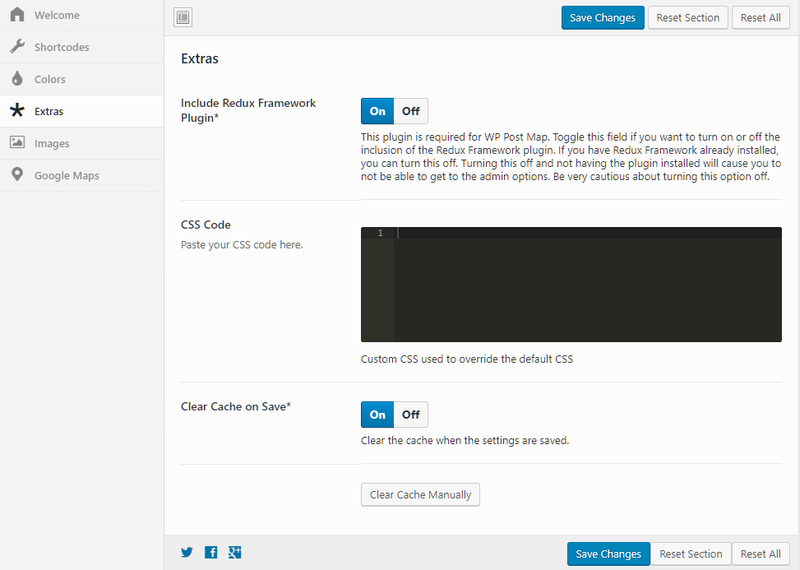 This plugin is required for WP Post Map. Toggle this field if you want to turn on or off the inclusion of the Redux Framework plugin. If you have Redux Framework already installed, you can turn this off. Turning this off and not having the plugin installed will cause you to not be able to get to the admin options. Be very cautious about turning this option off. Custom CSS used to override the default CSS. This CSS will be loaded on each page, so be specific if you have certain pages that need the CSS applied. You do not need to include style tags. Clear the cache when the settings are saved. Click the “Clear Cache Manually” button if you want to clear the cache without saving the settings. Also, use the “Clear Cache Manually” button if you have turned off this option.